In-store buy backs are held at the middle & end of terms. Once determined, dates will be posted on the bookstore website, Blackboard, & around campus. You must bring your student ID with you to the buy back. Missed the in-store buy back? 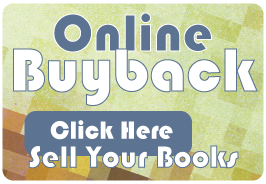 You can now sell your books back direct to MBS Online! *Pay no shipping by printing out the provided shipping label. *Receive your check within 3 weeks of MBS receiving your books. Click the link below to view ISBNs in your current buyback alert list. This list may also include books you have previously purchased through this site.